A male 25 y.o 3 months ago was fixed by the Ilizarov fixator applied somewhere else for comminuted femoral fracture after low velocity shotgun wound. Wound healed without infection. Knee ROM is only 20 degrees to date. Recent xrays attached. I think about conversion to an intramedullary nail at least to improve knee function. Pin sites and the femur in general show no signs of infection. L- 5,1x10^9/l, ESR - 27 mm/hr. But 2 weeks ago he reported episode of hyperthermia 39 degrees and pain in the femur. After 2-3 days all signs disappeared with 5 days of i/m cefalexin. Is now the surgey rational? What additional tests should be performed if any? Should the fixator be removed on the table or prior (how long?) the surgery? What anibiotic is optimal without any confirmed infection agent and for what period before and after the surgery? I would be nervous re: intramedullary sepsis. I guess you could remove the fixator under genl anesthesia, currette/culture, and treat with antibiotics appropriately. The nail at some point when things quiet down. I don't plate many femoral shafts, but I would consider a bridge plating along with muscle release. You could even go sub-q with the LISS system. I know that ex-fix followed by plating has been a good option in the tibia, and has not led to high infection rates- something that can't be said with IM nailing after ex-fix. For the remainder of the series 42 patients were all staged...i.e. frames removed and pin sites curretted and irrigated...post debridement cultures taken and deep culture specific antibiotics given if culture +. Secondary procedures then followed once the pin tracts had completely healed. Secondary Plating or IM nailing was very successful. Basically the protocol was much the same as that suggested by Drs. Watson and Kuldjanov except that they added the requirement of a negative pre-nailing pin-tract biopsy. As the safest way (infection and non union less probable), I would consider atrophic pseudarthrosis resection, acute compression and proximal lengthening with Ilizarov frame for this case. Later it will be necessary a quadriceplasty. What sort of nailing was performed in these cases? Were nails solid or cannulated? Reamed or unreamed? What kind of infection was occured? When? What measures it required and what it was resulted with? All our femoral exchanges were either before 3 weeks since ex-fix application or unintenionally later than 1 month after fixator removal. But recent months i performed 4 similar ex-fix to IM nail exchanges in tibial fractures, and two of them (with prior fixation 2 and 4 months) were done immediately on the table, and pins/wires were being removed one by one while nail was inserted. In two other cases (2 and 11 months of prior exernal fixation) fixator was removed 5 and 10 days before the surgery because of some drainage (not pus clinically) from pin sites. Unreamed solid nails (UTN) were used in all cases. All 4 proceed to uneventful healing with 4-5 days of oral ciprofloxacin. Now i think either it was incredible luck, or staphyllococci at your side are much more angry, if also solid unreamed nails were used. BB> Basically the protocol was much the same as that suggested by Drs. Watson and Kuldjanov except that they added the requirement of a negative pre-nailing pin-tract biopsy. This paper is about exchange nailing for ex-fix with confirmed multifocal osteomyelitis of pin sites. In the discussed case no one wire/pin shows signs of infection after 3 months of fixation. So hardly ever so rigorous protocol was necessary for the case. Watson and Kuldjanov said they had an 88% infection rate with late, non-staged exfix-IM nail exchanges - even with *pristine* pin sites. With confirmed osteomyelitis of the pin sites, Rubel et al had no infections with late exfix-IM nail exchanges if staged pre-nailing pin-tract biopsies were negative. In four cases you discussed 5/2/2002, there was apparent avoidance of infection with late exfix-IM nail exchanges (2 non-staged, 2 staged) treated with 4-5 days of oral ciprofloxacin. "Now i think either it was incredible luck, or staphyllococci at your side are much more angry, if also solid unreamed nails were used. " The question I am trying to raise is that if there is any doubt as to the possibility of pin tract colonization, why not take the added precaution of staged pre-nailing pin tract biopsies? BB> Watson and Kuldjanov said they had an 88% infection rate with late, non-staged exfix-IM nail exchanges - even with *pristine* pin sites. Don't you know what nails were used in their series - solid or hollow? BB> possibility of pin tract colinization, why not take the added precaution of staged pre-nailing pin tract biopsies? Do you mean to take a culture with fixator in place? Or you ask why not operate after a period of time to allow pin sites to heal? I wouldn't trust too much our bacteriology reports. In view of so discouraging infection rates as reported Dr Watson for the non-staged group definitely the lag period is necessary. The only problem is what to do with the leg (and patient) after external device removal before nailing. If the patient has been mobile recent weeks, he would not be too enthusiastic about bed traction. Maybe it is worth to insert new pins/wires prior to remove the old ones, to keep external fixator in place and allow the level of activity? So 5th day i am about a nervous breakdown. After the surgery except the cold shower from the group a laboratory report was received that he is also HIV and hep. C infected. So i keep fingers crossed. I attached xrays and current view of the leg. All looks calm at the moment... How long to proceed with antibiotics and heparin? The patient feels fine, no fever, ambulates with crutches, knee ROM is 0/90, and he is going to leave for home tomorrow. Comments and moral support are welcome... THX in advance. I'm happy to provide moral support. 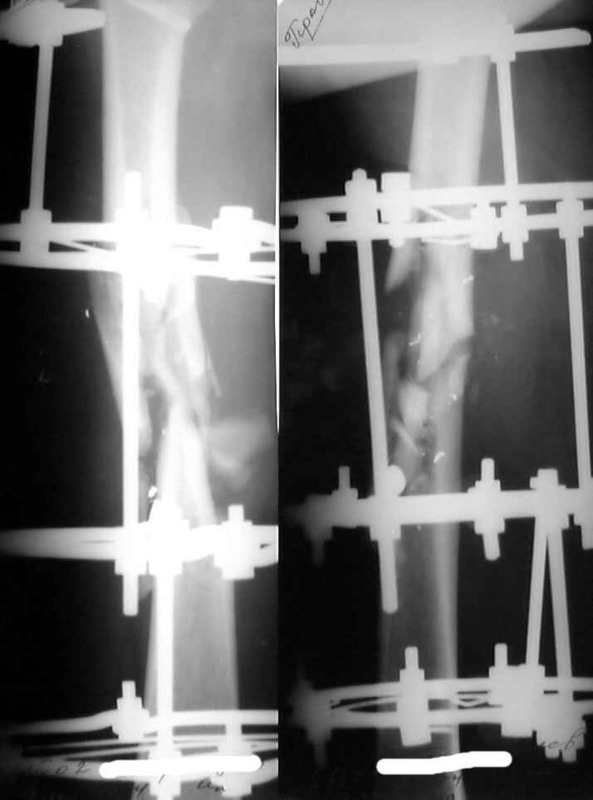 I know for a fact that it is possible to obtain good healing with an intramedullary nail after external fixation as I've seen dozens of successful cases. So in this instance you should watch and wait and if this patient has a problem with infection then treat it. If he doesn't, great for everyone. Intramedullary nailing is fundamentally an excellent technique (mechanically and physiologically) and will overcome many (but not all) technical and situational problems. That doesn't mean that you should keep nailing them until you experience an unacceptable infection rate. Especially with HIV + etc. Meaning that you don't nail a HIV+? Meaning I expect a significant infection rate if performing IM nail after XF and I expect it would be even higher with IM nail after XF in cases with HIV + and would seek out alternative treatments with lower or more acceptable infection rates. Tac> I'm happy to provide moral support. Tac> That doesn't mean that you should keep nailing them until you experience an unacceptable infection rate. Especially with HIV + etc. Certainly. According to your experience does nail design (solid or hollow) and technique (reamed/unreamed) influence infection rate in similar cases? I feel that there may be some point in Alex's statement though yet to be proved scientifically. From what I know during the original work of Ilizarov the role of antibiotics was minimal which is not the case in my experience. Of course HIV was unknown in those days. May be this is a food for thought and some work in future- to do an intercontinental study on the virulence of the same organism. (I am unaware of such a study if already published).